Bainbridge is home to one of the nation’s best local food blogs, according to gourmet magazine Saveur. 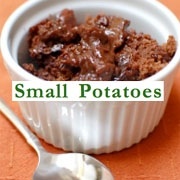 Small Potatoes, Anne and Ryan Willhoit’s online exploration of good eats from close to home, is one of five blogs named in the local cuisine category. Small Potatoes is photo rich and has plenty of step-by-step tips on how to make use of seasonal and often island-grown ingredients. A few highlights: small batch ketchup, eating local foods while backcountry camping and how to eat local in winter.